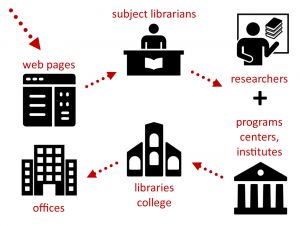 As a digital humanities librarian, E. Leigh Bonds (The Ohio State University) undertook an institutional environmental scan as the basis for assessment, identifying gaps, and developing recommendations. In this post, Bonds details her approach and framework, which prompted conversations and coordination across campus. Having never conducted a formal environmental scan before (or even witnessed someone else doing one), I turned to the literature: no one charged with such an undertaking—regardless of campus size—does so without consulting those who have already charted their own environments. From recent publications (see Works Consulted), I gleaned that the scan should determine the nature of DH work underway, researchers’ interests, researchers’ needs, existing resources, and gaps in resources. All of the information gathered would then be complied into a report—in my case, an internal report for the Libraries’ administration and the head of the research services department—that included recommendations based on the findings. Environmental scans should determine the nature of DH work underway, researchers’ interests, researchers’ needs, existing resources, and gaps in resources. To validate my findings, I next met with the subject librarians for each of these departments. I shared the findings from my “distant scan”; they gave me further information about what I’d found and, in a few cases, about what I hadn’t found. Additionally, these meetings gave me the opportunity to talk with my new colleagues about DH and my role, and to gauge their understandings, interests, and experiences with DH work. In the subsequent months, I met with the majority of the faculty on my list. I asked them about their interests, experiences, and ideas for both their research and for integrating digital humanities methods and tools into their courses; the resources they have and those they lack; their graduate students interested in this work; and about what they envision for DH on campus. From these conversations, I learned about the various digital methods and tools being used, and the resources available and still needed on campus. I also learned about the initiatives faculty had undertaken prior to my arrival on campus, like establishing a working group and proposing an undergraduate minor. In addition, I scheduled appointments with the directors of the humanities- and arts-related programs, centers, and institutes on campus with affiliated faculty doing DH work. During these meetings, I asked them many of the same questions I asked the faculty, but I focused more on the forms of support they provide and the resources they have available for humanities research. As I met with the key researchers, I also began meeting with faculty and staff in several support units across campus. Within the Libraries, I found several staff supporting digital research projects in a variety of capacities: special collections, archives, digital imaging, digital initiatives, copyright, metadata, acquisitions, and application development. In meetings with each, we discussed their involvement in this work thus far, interests in continued involvement, and resources. In the College of Arts and Sciences Technology Services, I met with three department heads to learn more about the research consulting (computation and data storage), academic technology (media and eLearning resources), and application development services. From them, I learned the specifics of the services offered, who in the humanities and arts were using their services, the types of projects they’d been involved in, and, in the case of application development, what costs were involved. In the Office of Research, I met with the development specialist to discuss funding opportunities for DH work and a research integrity officer to discuss university policies governing intellectual property and data ownership. Not only was it important for me to learn about these matters myself, it was also important to learn to whom to send faculty to discuss funding opportunities and intellectual property matters as they arise. I was less interested in labeling than I was in learning what researchers were doing or wanted to do, and what support they needed to do it. Ultimately, I viewed the environmental scan as the first step towards coordinating a community for researchers with DH interests. 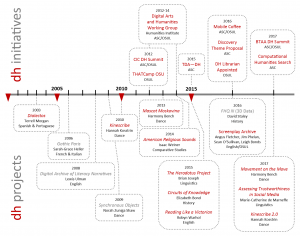 As Alan Liu remarked about his “Map of the Digital Humanities,” I never intended this to be “the last word.” Instead, I wanted it to be a catalyst for continuing conversations on our campus. Likewise, I wanted the history of DH on campus to raise awareness that researchers had been “doing DH” for quite some time—without an institute, center, program, or other form of structured support. For this section of the report, I opted to show rather than tell. 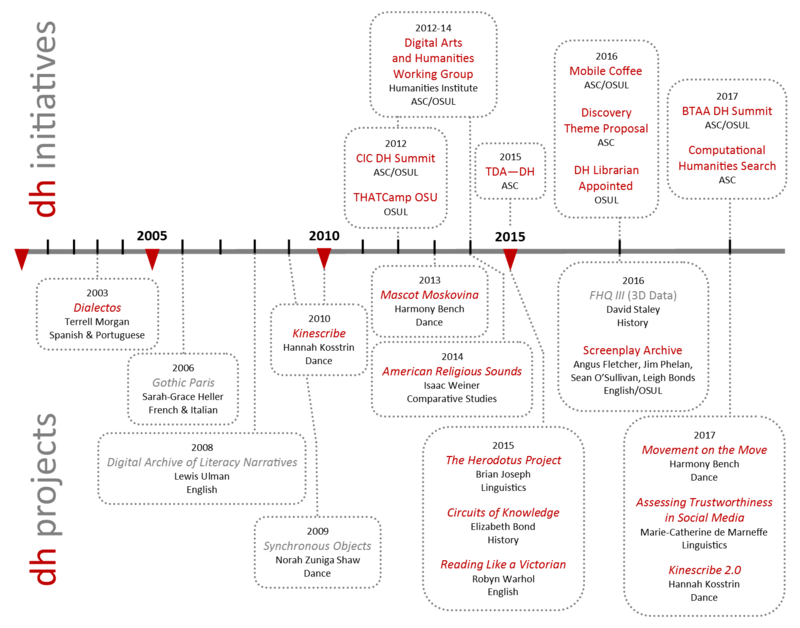 Admittedly, this timeline of initiatives and projects was not comprehensive; it did, however, reflect the key points that DH had been on campus since the early 2000s and the projects are increasing both in number and in complexity. And in the report, I explained the specific support and resource requirements for each stage, including consultations with experts in digital methods, content/project management, platforms/tools, and funding. I wanted the history of DH on campus to raise awareness that researchers had been “doing DH” for quite some time—without an institute, center, program, or other form of structured support. In each of these sections, I outlined who provides the support/resources on campus and off-site, the specific support/resources available on campus and off-site, whether costs are involved, and any conditions that apply to the support/resources. The section about digital content focused on three common forms: content in older formats requiring digitization, content existing in digital formats, and content generated by the project. I listed the specific sources for each content form (e.g. researcher, collaborator(s), OSU Libraries, external libraries/museums, vendors, work for hire), and indicated whether any costs are involved or whether any conditions apply (e.g. limited format types, limited permissions). Due to the costs involved, I differentiated work for hire (e.g. students, staff, external services) from collaborator(s) as a source. The discussion in the development, hosting, and curation section was further divided by whether a project has funding or not. In the infographic included in my report, the specific units on campus providing support in these areas were listed, and off-site was included as a resource option for hosting and curation. Again, I differentiated work for hire from collaborator(s) for cost reasons. To highlight gaps, it was important to emphasize that some of the resources remain conditional (indicated by a dashed outline) even when a project is funded and some of the resources involve costs (indicated by the dollar sign) even when a project is not funded. Finally, I invited thirty-eight faculty identified during the scan to complete a survey about their experiences developing a DH project and about their needs (and the needs of their graduate students).3 I asked those who’d developed a project to rate the level of support they received for specific stages of the project lifecycle—from refining project scope to development to maintenance—and to identify which units on campus provided that support. I asked about funding, collaborators, external support, and work for hire for past and current projects; and I asked everyone what support they would need to develop a future project. The twenty responses I received—a 52.6 response rate—validated and further supported the findings from my conversations. These categories reflect the scaffolding I envision for DH programming with different sessions, workshops, and working groups building upon one another and becoming increasingly more specialized and project-specific. All of the information I gathered during my first eight months at OSU exposed seven foundational gaps related to infrastructure, development/design support, and learning opportunities. Of course, anyone reading the report could have surmised the list themselves: I’d pinpointed the project requirements for each stage, reviewed the existing support and resources, and conducted a survey of researchers using DH methods and tools (the results of which were included in an appendix). As a result, the recommendations in the concluding “Future Directions” section prioritized addressing the gaps in the infrastructure—on which the majority of future initiatives rely—followed by providing learning opportunities for faculty and graduate students. I subdivided the section into recommendations for my role as the Digital Humanities Librarian; for the Research Commons as the research hub; for the Libraries as both DH producers and supporters; for a partnership between the Libraries and the College of Arts and Sciences; and for consortial partnerships. In making the recommendations, I took capacity and scalability into account, knowing that many of the infrastructural gaps—as well as researchers’ desires for academic programs and centralized support—could not be remedied by the Libraries alone. For the purposes of these recommendations, whether the Libraries or the College could or would meet these needs or fulfill researchers’ desires didn’t matter: I simply identified them as areas to address. Not only did the spreadsheet provide a quick point of reference for who’s doing what, it also provided administrators with points of contact for further investigation. Rather than the culmination, the report was, in fact, the beginning—the first iteration in the environmental scanning process that will continue both formally and informally. In May, I submitted my environmental scan report to the head of the research services department, who submitted it to the associate directors and the director. Over the course of the summer, the report was dispersed more widely within the Libraries, sparking a number of important conversations about workflows, scope, and scalable support structures. In addition, it directly informed the planning for workshops, learning sessions, and working groups through the Research Commons. As administrators and deans discuss funding and partnerships in the coming months, I’ll be consulting with researchers, collaborating on projects, and coordinating the DH program. Each of these points of contact provides opportunities to continue environmental scanning, to expand the campus support network, and to establish the community of researchers. Rather than the culmination, the report was, in fact, the beginning—the first iteration in the environmental scanning process that will continue both formally and informally for the remainder of my time as the first. Anne, Kirk M., et al. “Building Capacity for Digital Humanities: A Framework for Institutional Planning.” EDUCAUSE, 31 May 2017. Accessed 28 Dec. 2017. Brenner, Aaron. “Audit of ULS Support for Digital Scholarship.” University of Pittsburgh, Sep. 2014. Accessed 28 Dec. 2017. Lewis, Vivian, Lisa Spiro, Xuemao Wang, and Jon E. Cawthorne. “Building Expertise to Support Digital Scholarship: A Global Perspective.” Council on Library and Information Resources, Oct. 2015. Accessed 28 Dec. 2017. Lindquist, Thea, Holley Long, and Alexander Watkins. 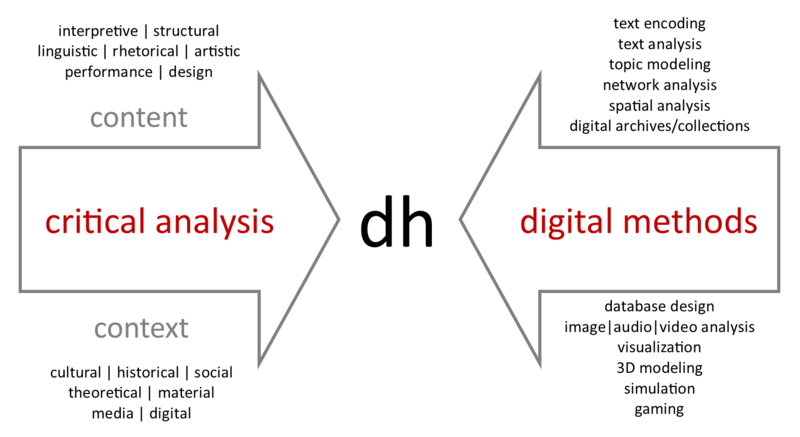 “Designing a Digital Humanities Strategy Using Data-Driven Assessment Methods.” dh+lib, 30 Jan. 2015. Accessed 28 Dec. 2017. Lippincott, Joan K. and Diane Goldenberg-Hart. “Digital Scholarship Centers: Trends & Good Practice.” Coalition for Networked Information, Dec. 2014. Maron, Nancy L. and Sarah Pickle. 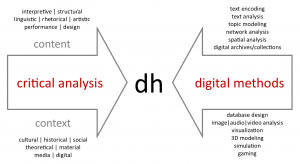 “Sustainability Implementation Toolkit: Developing an Institutional Strategy for Supporting Digital Humanities Resources.” Ithaka S+R, 18 June 2014. Accessed 28 Dec. 2017. Rosenblum, Brian and Arienne Dwyer. “Copiloting a Digital Humanities Center: A Critical Reflection on Libraries-Academic Partnership.” Laying the Foundation: Digital Humanities in Academic Libraries, 15 Mar. 2016, pp. 111-26. Accessed 28 Dec. 2017. E. Leigh Bonds is an Assistant Professor and Digital Humanities Librarian at The Ohio State University. She holds a PhD in English from Texas Tech University and serves as a co-coordinator of the DLF Digital Scholarship Working Group and as a member of the Big Ten Academic Alliance Digital Humanities Committee.